This chocolate cake is rich and moist and chocolatey. So very chocolatey. I have been making this cake for years and it still a family favorite. I like to bring it to pot lucks and parties because it tastes amazing and it looks pretty impressive too. Best of all, it is not hard to make. Part of the reason this cake is so easy to make is because it uses a box cake mix. But you make an ordinary box cake mix even better with pudding and sour cream. It will make the cake rich and moist. Then top the cake with a satiny smooth chocolate glaze. The glaze is only a few ingredients and so easy to make. I always use semi-sweet chocolate chips, but you can substitute milk chocolate if you prefer. Word of warning: DO NOT overheat the chocolate glaze or it will separate and get grainy. I make my glaze in a microwave and I don’t have issues, but here are a few things to remember. Add all the ingredients before putting it the microwave, if you melt the chocolate and then add the other ingredients, it will separate. Start with 30 seconds and stir and then return to the microwave for 10-15 seconds and stir again. By now the bowl will be warm and you can use that warmth to continue to melt the chocolate and butter, just keep stirring with a whisk and everything should melt. You can also use a double boiler instead of the microwave if you prefer. Preheat oven to 350 degrees and thoroughly spray bundt pan with nonstick spray. In a large bowl add cake mix, pudding, sour cream, vegetable oil, eggs and water. Mix together, until combined. 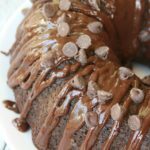 Stir in chocolate chips and add batter to a bundt pan. Bake for 50-55 minutes, or until top is springy. 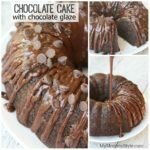 Let cake cool completely in bundt pan and then add cake to plate and cover with glaze (see below for recipe). Add all ingredients to a microwave safe bowl. Microwave for 30 seconds and using a whisk, stir. Microwave for 15 more seconds and whisk again. The bowl will be getting warm so as you whisk the chocolate chips and butter will continue to melt. Whisk until completely combined or add to microwave for 10 more seconds, if needed. DO NOT overheat the chocolate or it will get grainy!